If you are uncertain of what you need, but know that you need something, a custom configuration is right for you. How Do Custom Configurations Work? It’s simple. Find your favorite pencil/pen and sketch out your room. 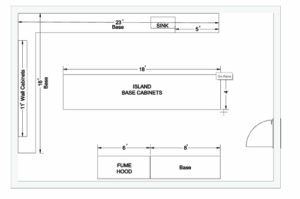 We don’t need room dimensions, but we do need to know what size cabinets you would like. If you want to get really fancy, feel free to send us a computer-generated layout, but a simple pencil sketch will work just fine. Once your sketch is complete, send it to kyle@nationallaboratorysales.com and he will provide you a quote. If you have any questions, please give us a call at (815)670-6400. Fume Hoods of all sizes are in stock and we can expedite the shipping process.